This issue's article is by Raji Sharma, a faculty member of the World Academy of Vedic Mathematics. It has been printed in a magazine published by the Swayamprakasha Trust at SreeMath, Hariharapuram, Karnataka, India. In mathematics unity means the number 1. '1' is the life giving force for the whole number system, because, it is from '1' that the whole system of numbers sprung up. Without '1' there could not be numbers like 2, 3, 4, etc., and hence no mathematics at all! Hence '1' is called 'Unity' or 'The Absolute'. From '1' arose numbers 2, 3, 4, 5, etc., by just adding '1' to itself. '1' can thus be compared to the life giving force 'God' , the 'primal Supreme Reality', because it is from this Pure Spirit that the whole universe with all its diverse forms is born. Just as the whole universe with all its varied forms arose out of that One Vital Force, similarly all the numbers with all their various properties were born out of '1'. The Pure Spirit resides in each and every form of life. In the same way '1' resides in every number as a factor. Of course we cannot 'see' the '1' in the numbers, yet we know it is there. It is a hidden presence. Just as we cannot 'see' the God in every form of life even though we know that He is present everywhere, in the same way we do not see the factor '1' in every number. The Infinite reality has limitless potentiality inherent within itself. Similarly the number '1' has unlimited potentiality to create different types of numbers. With the help of the various operations like +, - ,x, divide, etc., it can create positive, negative, rational, irrational and imaginary numbers. Yet all these numbers cannot exist without '1'. Consider the fraction ½. (Half). Now we know that 'half' cannot exist without the 'whole'. Since '1' represents the whole, the idea of half is possible. Even the imaginary numbers arise from square root of '-1'. Thus '1' is 'All Pervasive' or the 'Absolute'. Let us now look at the magical number 'Zero'. The symbol is '0'. In fact '0' is not an ordinary number. We can say that '0' is just a symbol to represent 'Nothing'. Robert Kaplan in his book titled ' The Nothing That Is' says, " If you look at zero you see nothing, but look through it and you will see the world." Zero is the small pivot on which swings the whole realm of mathematics. The invention of 'zero' by the ancient Indian mathematicians made arithmetic infinitely easier. It now forms part of the binary code which powers all computers. It is because of '0' that the very idea of place value was possible. The pride of giving this to the world goes to India. With just 9 symbols and a '0', our ancient mathematicians could write any number as big as they wanted. Zero brought variety to numbers. Consider '0' by itself. You have nothing. Put it next to '1'. You have '10'. Add as many zeroes as you want now. You have a staggeringly big number whose value you cannot even tell. We can proceed towards infinity as we add more and more zeroes next to '1'. This is why in Sanskrit zero is also called 'Anantha' the 'Infinite'. This is the power of '0'. Possessing no value itself, it is able to confer infinite value to '1' by just placing itself next to it repeatedly. '0' is thus able to confer infinite forms and values not only to '1' but also to other numbers. Now we saw that '1' is related to the 'Supreme Reality' or the 'Pure Spirit'. To what is '0' related?. What is that inscrutable, inexplicable mighty power which is the cause of the multifarious creations in the universe, which makes the impossible possible and creates differences and distinctions?. It is 'Maya'. Maya is defined as 'That which is Not'. Swami Swaroopananda has explained 'Maya'as follows. " One cannot say that she exists nor can one say that she does not exist. She is not separate from the Lord, nor is she one with the Reality. Hence Maya has been described as Shakti, the incomprehensible and mysterious power by which the Infinite projects the universe." Because of Maya, 'One' appears as 'Many'. There are many different types of life forms as well as inanimate forms due to this Maya Shakti. The entire play of creations is made up of Maya. It is only because of Maya Shakti the Supreme becomes Ishwara and takes different forms, so we can worship him in his different forms. Remove Maya, all the infinite forms vanish and only the supreme reality is left behind. Similarly 'Zero' is able to confer infinite values to 'unity'. Let us consider an example which brings out the power of '0'. Let us try to factorise the following expression. We cannot find any solution or method at the outset. It seems impossible to factorise the given expression, since it is of the form 'a^2 +b^2 ' Let us now call '0' to our aid. Let us add '0' in the form '16x^2 - 16x^2' to the above expression. Thus we see how '0' has helped us in factorizing an expression which seemed impossible to factorise. In this way '0' can help us in solving many equations. This is the creative power of 'zero'. 'Zero' can be added in any form we want, and those forms always occur in pairs, one positive and another negative. Just as Maya manifests duality in all forms like, the good and the bad, strong and weak, young and old, likes and dislikes, light and dark, etc., 'zero' brings into focus the dual nature of any number. Remove Maya and duality vanishes. Similarly, it is due to '0' that negative numbers exist. Thus every number has its opposite number, like 2 and -2, 3 and -3 ½ and - ½. Also, 2 + (-2) = 0, 3 + (-3) = 0, etc. Together these opposite numbers vanish into '0'. Yet '0' has no sign nor any opposite. There is only one '0' like the one and only one 'Maya Shakti'. Maya shakti creates opposites, differences and varieties yet Maya shakti itself is unaffected by all these differences. Similarly '0' has given birth to opposite numbers but it has no opposite number. It is unique. Thus '0' has infinite power. Like 'Maya shakti' '0' can also take infinite forms and vanish whenever it pleases. Once Swami Chinmayanandaji was asked, "How is it that Lord Krishna had 64000 wives?" He replied thus. "The stories of Mahabharata and Ramayana and other epics should not be taken literally. Each story contains deep philosophical meanings. There are about 64000 types of thoughts in our minds. Lord Krishna represents the divine spark. He is the one who infuses life into each of these thoughts. Without life, there can be no thoughts. It is because of the presence of this 'life spark' the thoughts materialize. Gopis are the materialistic representation of these thoughts." Now '0' is like a thought and '1' is the 'Absolute'. When these two stand as one we have '10'. With the help of '1' and '0' we have infinite varieties of numbers. Just as thoughts become very powerful and materialize into matter due to the divine will, in the same way 'zeroes', which are valueless become very powerful due to the presence of 'one'. Thus '1' and '0' empower each other. Thus the cosmic dance of numbers go on. A series of weekly articles on Vedic maths is being published by NIE (Newspapers In Education, a subsidiary of the Times of India), Mumbai. This is an influential and much read publication, for children. The articles are being written by five faculty members of the World academy of Vedic mathematics and the series started on 20th December 2004. It has been suggested by Paul Mills, London, England that a good story on Vedic Maths would be a great asset. Below is Paul's letter. Why is it that none of your readers has striven to write a Vedic Maths story for children or just a book in general? If a book was written for individuals to read, then more non Vedic maths persons may become more interested. You could offer a competition via this newsletter, whether in essay format or short story, and then you could collate the best of them and publish them for a wider readership. But maths can only get a wider readership, that is of Vedic maths, by becoming getting a good story book into print. Even if characters from the Indian myths were incorporated to enhance the teachings. The asura teaching the ignorant novice English boy, how to learn vedic maths, and beat the English system. Or some other rather blasé formulaic approach. But it needs to be done; even just to stimulate another aspect of writing and vedic maths within your newsletter." Are you a story writer? If so, please send us your story, which we could circulate via the newsletter (in full or as a synopsis) and which may be published in a book. "It is widely believed that the foundations of mathematics were sorted out long ago. This is not so. The truth is that not one of the established systems can be shown or even trusted to have sound foundations." Many favourable comments have been received following the merging of three Vedic maths web sites as announced in the last newsletter. This web site has had further improvements and updatings in recent weeks. If you are involved in Vedic maths please check references to yourself and/or your organisation. Also any hyperlinks you had to pages within the old sites will need updating. If you have any suggestions about the site please let us know. From time to time we see references to Vedic Mathematics being used by NASA, often with regard to artificial intelligence. Do you know where this idea may have originated? If you have any information or ideas about this please email us at . 21st Century Books in Fairfield, Iowa, USA, have recently opened a bookshop on the internet where several Vedic Maths books can be purchased. See http://www.21stbooks.com/. 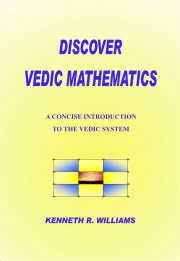 If you "search by subject" and click on "Vedic Math" you will find a range of VM books. Email : Tel : 98208-45036. Email: I have two extremely bright 13-year-olds working on algorithms to show how much faster Vedic Maths would be when applied to programming multiplication. They are doing this for a project in the young scientist exhibition. Would you recommend other computer applications, which would show this?